In my last article, I talked to Alice MacGillivray about how she went from horse newbie to successfully participating in riding a scored USDF Training Level test with her Fjord mare, Bocina. One factor that stood out for me in talking to Alice, was the role that the support and encouragement of her Gabriola Horse Group community played in helping Alice get to that point. In today’s individual-oriented culture, it’s easy to look at someone’s accomplishment and marvel at what they were able to achieve. But the truth is, if you get a chance to take a look behind the scenes of that success, you will most often find a group of people. This is because of a phenomenon I call “group energy”. Group energy is the extra spirit or lift that comes into being when you have a collection of like-minded individuals getting together for a common goal or intention. This spirit gives velocity to all of it’s members. Think of NASCAR, or the bicycle racing peloton, where each participant is being carried along by the air streams of the others. In these sports, the winning driver or rider is the one who can work with these drafts, being carried to the lead by the streams of the other cars or bikes. Often members of the winner’s own team chip in to make this happen. This was originally written in 1972 by Dr Robert McNeish, a teacher from Baltimore, MD. Presented here with adaptations. Lesson: People who share a common direction and sense of community can realize their dreams and goals easier and more quickly because they are traveling on the thrust of one another. Lesson: If we listen to our inner guidance, it tells us to stay in formation with those headed where we want to go. We are willing to accept their help and give our help to others. Lesson: You don’t always have to be the strong one. It pays to take turns doing the hard tasks and sharing leadership. 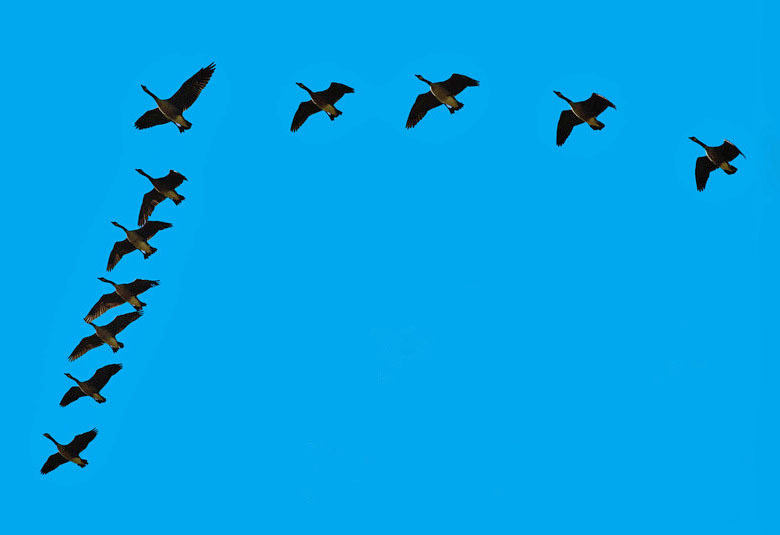 As with geese, people are interdependent on each others’ skills, capabilities and unique arrangements of gifts, talents or resources. Lesson: We need to make sure our honking is encouraging. In groups where there is encouragement, the success is both more profound and more gratifying. 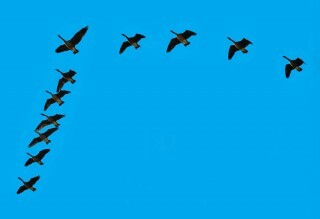 The power of encouragement (to stand by your goals AND cheer on the goals of others) is the quality of honking we seek. Even virtual groups, like being a member of Improve Your Ride, can be a source of group energy and have this uplifting effect. Even if you never meet the other members, I believe that each of us is creating a draft with our movement, and we are helping each other along. Take a moment to think about how joining a local or virtual community of like-minded souls can assist you with your horsemanship goals, help you stay motivated, keep you on track, add to your fun, and how their support can make things a bit more effortless. I love the lesson that our “honks” should encourage. What a great article. As a very new, athletically challenged rider it’s encouraging to hear that much more experienced riders face challenges too. Honk, honk!